Published by: August Home Publishing Co. This CD is a a collection of what the authors considered the best woodworking tips and techniques from Woodsmith, ShopNotes and Workbench magazines. This is an easy-to-use CD-ROM in PDF format, so you'll need Adobe Acrobat Reader. Also provided on the CD along with a nifty Woodworking theme screen saver that shows a Woodworking Tip from the CD on your desktop and an index to past issues of WoodSmith and ShopNotes magazine. 3 woodworking plans are included on the CD: a simple planter, a slatted shelf, and a frame-type planter for supporting tall plants like Sunflowers. There is a link provided that will take you to PlansNow online where you can choose from several plans that are available for purchase, and of course a link to subscribe to WoodSmith or ShopNotes magazines. There were more than 100 tips in 12 different woodworking subjects. One of the things I liked was that they didn't use any of the "too-simple" kind of tips that so many other "Tips" books and CD's seem to use just to be able to advertise "100" tips or "500" tips. These were all very useful tips, and this would be a very valuable reference for the new and experienced woodworker. 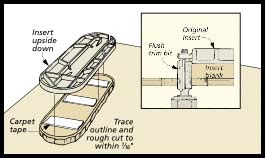 I use the illustrations to augment tips I give on various Woodworking forums. There is also a printer friendly conversion so you can print out and make your own Tips reference book. All in all, a good Tips collection in an easy to use format. The CD is fairly easy to use, but would benefit from having a search function, although an index for all the tips are displayed on a single page. Editor's Note: You can purchase this CD from August Home's website.